It all began when Chloe (voiced by Drew Barrymore), a diamond-clad ultra-pampered Beverly Hills Chihuahua who gets lost while on vacation in Mexico. Papi (voiced by George Lopez), an amusing Chihuahua who's crazy about Chloe, springs into action and heads south of the border to rescue her, while Chloe gets help from Delgado (voiced by Andy Garcia), her newfound friend and self-appointed protector. 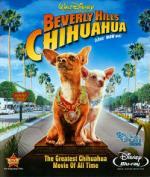 Beverly Hills Chihuahua from Walt Disney Pictures is a heartwarming and outrageously funny tale proving once again that good things do come in small packages. It's a real treat for the whole family — especially in Blu-ray™ High Definition. Felt like something that would just be fun to watch... and decided to pop this one in. A cute Disney movie with a laugh here and there. Worth the time put in to watch it... but to be honest I have seen better of it's type. But still... if you can find it cheap... it's one I would recommend checking out for a little fun. Strangely though, if you grow old enough even "The Three Stooges" suddenly become an intellectual masterpiece (again). So three years later that may even be correct for the Chihuahua franchise. I've only seen the trailer for this one. I thought it looked pretty stupid. OMG, the trailer for Chihuahua is so stupid. It's a terrible trailer. The movie is actually pretty cute and funny.